This week on The Teller and the Tale, I catch up with Scottish storyteller Elly Crichton Stuart to talk about her life as a storyteller and to hear her share one of her favourite stories. Elly is a mindfulness practitioner who is passionate about storytelling, performance and poetry as tools for transformation. Working with heart, humour and creativity, Elly aspires to lead people on a journey towards wholeness. Elly trained at Arts Educational Drama School and worked as a performer and workshop leader for many years. In 2003 she left The Unicorn Theatre for Children, where she had worked for 6 years, to go to The School of Storytelling at Emerson College. 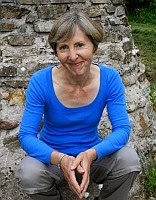 In 2006 she returned to Essex University (M.A in Art History 1980) to study The Tale with Marina Warner. Go to www.bluesandrootsradio.com and click on the "Listen Live" button. More about the Teller and the Tale at www.thetellerandthetale.com and at www.facebook.com/thetellerandthetale.